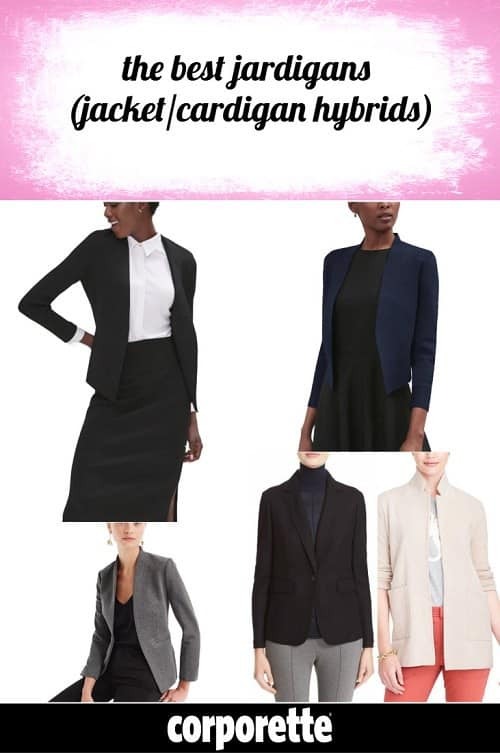 Sure, we all know what wardrobe essentials for work professional women are supposed to have in their closets, but if you’re buying one for the first time or replacing one you’ve worn into the ground, it can be a pain to find exactly the right incarnation in stores. In “The Hunt,” we search the stores for a basic item that every woman should have. I don’t know if the phrase “jardigan” was around before MM.LaFleur’s best-selling jacket/cardigan hybrid, but I do feel like they have not only made the phrase more common but in many ways set the bar for what to expect from a jacket/cardigan hybrid in terms of comfort, quality, and style. (At top, the two MM.LF jardigans: the shorter Sant Ambroeus, and the longer Woolf jardigan, both $195 and available in sizes XS–3X. Here’s our last discussion on the Sant Ambroeus.) Still, $195 is a lot to pay even for MM.LF’s beloved jardigan, so I constantly see readers searching for dupes or sharing notes on what was similar. So let’s go on a hunt today for jardigans, ladies, aka sweater blazers, knit blazers, and more… Which are your favorites? Where did you get your favorite jardigans for work, and how do you wear them? Two other affordable options not pictured: the J.Crew sweater blazer ($49 today!) and the Alfani cardigan, which looks to be almost sold out this season but will surely come back next season in a slightly different iteration (here’s an older version at Overstock (regular & plus) and Amazon in plus sizes). Ah yes, and how could anyone forget about this super popular knit jacket, available in regular and plus sizes in a zillion colors? seeing how popular this jardigan is and how manhy complain about the price point… I wonder why the ann taylor/banana republics/j crews haven’t created a dupe at the $100 price point? c’mon guys we have a market for this! I have one from Banana I bought a few months ago! I never found it online. It was literally the only one in the store, in the clearance section, and it was my size. It’s perfect. I have one from ASOS a few seasons ago that’s almost an exact dupe of the grey one above, but with sewn-shut pockets. I believe it was under $50. Keep an eye out. I actually did not like the MM LaFleur Jardigan when I tried it on. (I think I did not realize the shoulder pads were removable.) This Banana version is closer to a cardigan but with much more structure than any others that I have. Ooh thanks for the tip, I’m glad to hear those have more structure. I love Banana’s silk/cotton sweaters. Brooks Brothers had a great ponte jacket for about $100 on sale. It did not fit me (I’m petite and the proportions were off) but the quality and feel were outstanding. It looks like Express has a dupe, although it is a a bit more waterfall in structure. It is $80 full price. It was profiled on Extra Petite today, and I recall someone mentioning it on this site before. I am late to this thread, but I mentioned the Express dupe recently. I am returning it. It was $80 or so but felt very cheap, was not lined (which is ok, as MML’s jardigans are not lined either) but seemed to need a lining as all the inside seams were haphazardly spliced together, and the sleeves were very large, which made it look like I had borrowed someone else’s jacket. I just got this one in black at Anthropologie and have to stop myself from wearing it every day. It’s super comfortable and looks great. I think it looks a little more formal than my Sant Ambroeus. How do you style this to look more formal? I clicked over the grey and it looks like it’s a swing cardigan with trumpet shaped, 3/4 length sleeves in a sweatshirt material. this one would be a hard look for me. Wait, really? Is the Anthro one very different in person? It looks way less formal than the Sant Ambroeus. The oversized drape swing shape read more casual to me than the more tailored design and cut of the Sant Ambroeus. The black Anthropologie one looks like a casual blazer, in my opinion. I think the Sant Ambroeus (which I’m wearing today!) looks more like a really really nice cardigan. I wouldn’t see someone wearing it and think that person had on a blazer. I wear the Anthro jardigan with silky shirts and keep it buttoned most of the day and think it looks as good as most other blazer that aren’t suiting material. The gray one looks considerably more like a cardigan or sweatshirt. Ah, okay. I see your point. I love the swing shape and the sleeves. I am a neat freak and DH is a slob. We have tried to compromise, but we are poles apart on this issue. I end up cleaning up after him because I can’t stand the mess, and I am tired. What are your experiences with hiring a cleaning service? Is it worth it? Of course cleaning services are worth it! However, a cleaning service isn’t going to follow your husband around and pick up after him, which is what it seems like you need. You are going to have to decide whether this is a deal-breaker (which it might be for me if it were bad enough), or whether picking up after him is a price of admission to the relationship that you are willing to pay. If the cleaners didn’t come every 4 weeks, H would never pick up after himself. If he hasn’t really done a good job, I toss all of his randoms into a file box. I swear he has never gone looking for anything in it. He is selectively blind or just doesn’t care. Yeah, certainly “cleaning up for the cleaners” is a great way to keep things from getting completely out of hand. OP, if you and your DH could spend a bit of time picking up the night before maybe that would help with the clutter. 1000% worth it. We have a weekly cleaner & I am fully convinced it’s the key to cohabitation (with anyone, not just a spouse). I’m the clutterer in my relationship. The rocket scientist is pretty good at picking up after himself but I end up scattering shoes and cardigans all over the house. Neither one of us is terribly motivated to clean things. The house cleaner every other week is worth every penny. We don’t have to feel guilty for not cleaning, and we don’t have to feel like a martyr if we clean something and the other doesn’t. And I pick up after myself at least every other Thursday. Am I the only one who despises this “jardigan” thing? But I strongly dislike cardigans generally. I do like the look and feel of some of the jersey blazers for more casual days. Maybe this is just my area (Midwest), but I can’t handle women who think cardigans are substitutes for blazers. The problem I have is that the “jardigans” just don’t provide the structure that a blazer do. For the office, I just feel more polished in a structured blazer. I like cardigans and wear them regularly, but I don’t think that one is a substitute for the other. I would look out of place in my office in a blazer, so I like them. Agreed- jardigans are not a substitute for a blazer. I do not like cardigans and the “jardigans” seem so shapeless to me. I’d prefer a blazer in sweater material, maybe without buttons or a big lapel to look a little more casual than a blazer. 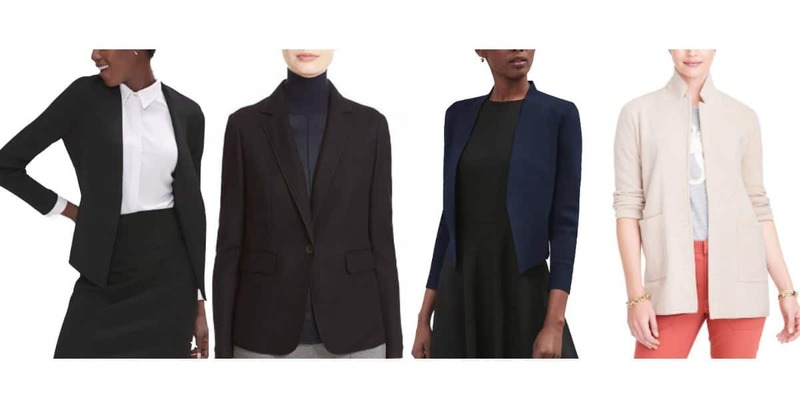 I have been wearing the Alfani sweater blazer a lot (version prior to the bell sleeves) and am hoping to be able to get some more once the latest rendition comes out. I hate cardigans for work but the MM La Fleur jardigan is really much better and structured – it’s sleek and not like your basic knitted cardigans. It’s much better for me over a sleeveless sheath dress than a blazer – it cuts at the right place on my waist (blazers don’t) and it’s tailored and not as stuffy or formal as a full suit for my purposes. Same. I LOVE my MM Jardigan (I have the longer one) and feel like such a bad a&& when I wear it over a belted sheath with shiny pumps. It’s so much better than a regular cardigan and works really well over a sheath. I also have the Anthro version someone linked to above. And I love it, too. But it’s not as formal as the MM version. Which is great, IMO, since it can be worn in different ways. I wear mine with the collar “up” – basically unfolded, laying flat. It’s wonderful. The bell sleeves don’t fit well under my coats so I don’t wear it much in winter, but I anticipate it being in heavy rotation once the weather warms lightly. Yeah, it looks like a collarless blazer on me and doesn’t get that weird ride-up shoulder bunch thing that blazers can when the shoulders aren’t wide enough (aka, all blazers on me). Other imitations don’t compare to the OG. Same. I gave up on cardigans except for most situations because they are actually shapeless on me, while a jardigan (or sweater cardigan) does actually have more shape – because they’re made of a slightly more structured fabric than a cardigan. I wouldn’t wear it to an interview, but I’ll wear it to a presentation where I might otherwise have worn a less formal blazer. I lump them into that category – a less formal blazer, like a collarless swing blazer, or a patterned blazer. Agree 100%. The real jardigan is made of a heavy knit and has exactly the right level of structure to wear with a sheath dress. As a smallish person, I like the simple lines and lack of collar and buttons, which overwhelming on me and detract from the sleek look of a sheath dress. You can’t “handle” them? What is it you need to manage about these women who conflate blazers and jardigans? I think it’s weird that it’s like this new thing, when I had a blazer-shaped-sweater like 15 years ago from Old Navy…? Maybe I’m missing something, but I don’t quite get the hype. Then again, I hate layers, so clearly I’m not the intended audience. Any reviews of Of Mercer? I clicked over to their website and some of the clothes look great! Attention petite UK ‘rettes… where do you shop (in London) for classic styles, especially for tops/blouses? I’m hoping to do a little shopping when I visit in June. I’m 5’ and usually a 2p. Trying to avoid a lot that seems trendy right now – cold shoulders, ruffles, flounces, long droopy sleeves. It’s not that I want shirt blouses per se, but simple, elegant looks. Thank you so much! I’m a short-waisted petite and I had great luck at Hobbs in London. Thank you! Really appreciate the tip. Also: Sketch for tea, and make sure to visit the loo while you’re there! This loo is a loo for the ages! Ha, I’m a short waisted petite now living outside of London and heartily sick of Boden, so thank you Senior Attorney for the Hobbs recommendation! I don’t think I’ve wandered in there yet. Only the J Crew one above looks like a dupe to me. I think key here is no lapels while being structured but soft. 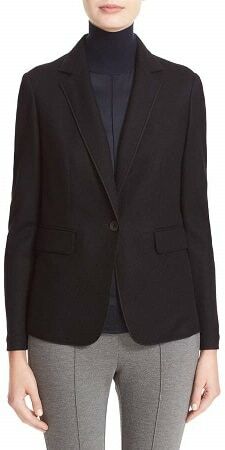 My favorite is from BCBGenaration – Welt Pocket Tuxedo Blazer. The JCrew one is actually a real jacket — no “jardigan” about it, other than the collarless look is similar. I actually love it since I have a short neck — some jackets hurt my neck to wear! This. It’s a blazer without a collar or buttons. It’s gorgeous, well-made and tailored, too. Gahhhh I can’t wait for mine to get here. At this point I”m waiting until July for mine. I ordered when it was only $88 and was so excited to get it in my petite size in grey and navy. So impatient! Attention petite ‘rettes who shop in London…where do you go for classic styles? Thanks! 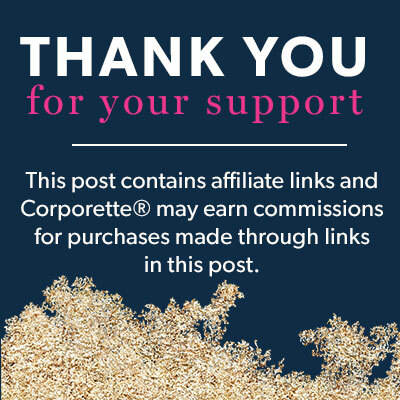 I think the blogger “Extra Petite” did a post on this. Has anyone purchased the Banana Logan trousers recently? Are these supposed to replace the Martin fit? There seems to be an annoying horizontal fold underneath my rear with these, and I see from the model photo on the website that the Ryan pants are worse. What gives? Are they catering to ladies with a more full-figured bone structure on bottom now? This is difficult for me as a petite, as it is hard enough to find pants that fit properly. I’m not thin, either. I have that “athletic” build with thick thighs and a 10″ difference between my waist and hips, but I just don’t have that KK can. I am obsessed with this Lauren Ralph Lauren knit sweater blazer. I have never liked cardigans; I like them on other people but feel frumpy in them myself. I much prefer the look of a blazer but some days I don’t want or need the more formal wool version. I found this sweater version, bought it in both colors, and wear them probably a bit too often. :) The fit is very much like my old J.Crew schoolboy blazers which I love and still wear, but a bit less formal. I found J.Crew’s sweater blazer a bit too unstructured for me, but this version is perfect! Thank you so much, I have been looking for exactly this forever! NO SHRUGS. NO-OH. No, I don’t want no shrugs, a shrug is a look that don’t get no love from me. I am ok with shrugs for some non-work occasions but they are definitely not business wear to me. Always on the casual side, in a too-small size, lookin’ M-O-B to me! I’m petite, shortwaisted, and hourglass shaped. So I unashamedly wear shrugs, because normal cardigans make me look like a shapeless box. I think shrugs look unprofessional when they hit above the natural waist (mid-back), but shrugs for normal-sized people hit me at my natural waist. So………more for me! I work in an office where cardigans are totally fine though. You also can’t wear a shrug with pants. Same to all of this. Cropped cardis work the best for me if I wear a cardigan. I cycle back and forth from jackets to cardigans year to year, mostly due to boredom I think. Nic and Zoe make open cardigans in a range of fabrics that are jardiganesque. Olivia Moon used to make a really nice ponte blazer that was sold at Nordstrom. I have it in two colors and wish I’d bought more. I work for a well regarded organization in a niche industry. Despite our great reputation, our internal corporate culture is flamboyantly dysfunctional. A few years ago the organization restructured and I landed in a position that does not play to my strengths or passions. I’ve tried to make it work but I’m consistently miserable. We have a new CEO joining us this spring. I believe in the organization’s potential to live up to its reputation I’ve been determined to stay and try to help make that happen but I’m losing faith and thinking of leaving. If I stay it would be hard for me to shift over to a position that is a better fit for me, there are very few opportunities for advancement within this organization and my most likely next advancement would take me further down the path that I’m on now. I’ve gone on a couple of interviews at a different, much smaller, organization in the same industry for a position that would be a far better match for my interests and skill set. Based on that experience, I feel that it’s realistic that I could secure a position in that role at a different organization even if this particular opportunity doesn’t work out. I have seven weeks of sick time saved up that I won’t be able to cash out and take with me. My husband and I are ready to try to have a baby. I’m 38 1/2. I’m worried about starting at a new organization while TTC or pregnant. 2. Look for a new position now, TTC, figure it out from there. I’m checking in with some allies at my current organization who are more highly placed than myself and who may have a better sense of how much of a positive impact our incoming CEO will likely have. My friends are all happily child free so aren’t able to advise on the baby question. My husband and family support whatever decision makes me happiest. Has anyone here dealt with a similar conundrum? Does anyone have advice for which path I should pursue? You are 38 1/2. To put this as gently as possible, you start TTC immediately and figure out the rest of your options from there, assuming the baby is important to you (it sounds like maybe it’s not and that’s a different issue, but if you want a legitimate chance at a baby, you start TTC now and go from there). Seconded. Prioritize. I understand you are passionate about your organization but your life goals come first, ahead of potential differences with a new CEO. Stay with the company for now and begin TTC, reassess in a few months. Thank you! I really appreciate the input. I’ve been so snarled up in my ongoing work challenges that it’s gotten hard for me to step back and accurately assess my big picture priorities. Hearing from some folks with a fresh perspective is very helpful and gave me the jolt of clarity that I needed. I emailed my doctor this morning and we’ve set an appointment for next week to remove my IUD. I have another two or three decades to finesse my work life, but the baby window is closing and I do need to prioritize that. Thank you for weighing in! I have this in black and love it. It’s definitely a cardigan but it has a collar and when buttoned it’s more fitted and gives a good shape unlike other cardigans. It’s super limited right now (and super on sale) though now. They do have a few other cardigans with a similar look though. I can testify to the Rag & Bone Club blazer (the last entry). I bought it in 3 colors! It is fantastic for work.